Posted on Tue, Jan 31, 2012 : 9 a.m.
Raised Waffles, from Marion Cunningham's "Breakfast Book." Not sure life gets any better. A simple way to tell whether or not you're leading la dolce vita is, in my opinion, waffles. I'm not talking about that rubbery travesty not worthy of the name found in the frozen food section. And I'm not talking about those huge, heavy "Belgian Waffle" disks made with pre-packaged batter that all the breakfast joints use and then try to disguise with a huge mountain of faux "whipped cream." I'm talking about the real deal, the delicate golden honeycombs your mother makes in the waffle iron she bought for you for $3 at a garage sale but then kept for herself because it turns out perfect waffles. 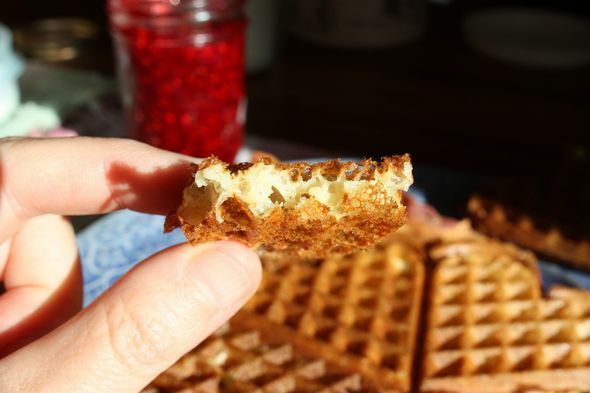 These waffles have a blistery crispiness on the outside and buttery tenderness on the inside. They are fragrant with yeast and as light as eiderdown. They are so good that I don't bother with syrup and jam and instead enjoy them "au naturel." My mom's waffles are so good that people beg her to open a restaurant that serves only breakfast so that they can eat them all the time. But since Mom hasn't opened that restaurant and I like to get that "life is good" feeling on a regular basis, I've learned to make my own waffles. I was looking at The Food Timeline's history of waffles (originally called "wafers") and waffle irons, which have apparently been around since the 1300s. The pre-electricity method of making waffles was not for the faint of heart or weak of arm. "Put two pints of rich milk into separate pans. Cut up and melt in one of them a quarter of a pound of butter, warming it slightly; then, when it is melted, stir it about, and set it away to cool. Beat eight eggs till very light, and mix them gradually into the other pan of milk, alternately with half a pound of flour. Then mix it by degrees the milk that has the butter in it. Lastly, stir in a large table-spoonfull of strong fresh yeast. Cover the pan and set it near the fire to rise. When the batter is quite light, heat your waffle-iron, by putting it among the coals of a clear bright fire; grease the inside with butter tied in a rag, and then put in some batter. Shut the iron closely, and when the waffle is done on one side, turn the iron on the other. Take the cake out by slipping a knife underneath; and then heat and grease the iron for another waffle. Send them to table quite hot, four or six on a plate; having buttered them and strewed over each a mixture of powdered cinnamon, and white sugar. Or you may send the sugar and cinnamon in a little glass bowl." Winter weekends are the perfect time for waffles, when you're spending entire days in your pajamas or at least getting up late. Because the best waffles require some pre-planning, it's good to have relaxed time so you'll remember the 5 or 10 minutes you need to get the batter ready the night before. You can make pretty good waffles with other recipes, but I will continue to argue that my mom's Raised Waffles, made with yeast, from Marion Cunningham's Breakfast Book are the last word in waffles. In a large mixing bowl (batter will rise to double original volume) put the water and sprinkle in the yeast. Let stand to dissolve 5 minutes. Add the milk, butter, salt, sugar and flour to the yeast and beat until smooth and blended. (Marion uses a rotary blender, my mom just uses a whisk). Cover with plastic and let stand overnight at room temperature. Just before cooking the waffles, beat in the eggs, add the baking soda and stir until well mixed. Batter will be very thin. Pour about 1/2 to 3/4 cup batter into a very hot waffle iron. Bake until they are golden and crisp. This batter will keep well for several days in the fridge. Since waffles are best piping hot, I do as my mother does and set up the waffle iron on the table so I can feel like I'm part of the breakfast crowd while I'm doling them out one by one. King Arthur's Baking Book includes this caution about waffles' potential for strife: "Waffles are best eaten as they come off the iron; they don't take well to stockpiling. This makes for serial eating, but it builds anticipation and probably contributes to general squabbling about who deserves the next one." I say, be nice to your waffler and they will be nice to you. Wed, Feb 1, 2012 : 3:46 p.m.
First winter after our wedding, I realized with horror that we had neither a waffle iron of our own or one given as a wedding gift!! Horrors!! I spent the good part of that day criss-crossing from one Ann Arbor appliance shop to the other until I found one that &quot;most resembled&quot; my mother's. (That cost 26 1970s dollars.) But the &quot;horror&quot; wasn't over: My next discovery was that my wife had only a few cook book waffle recipes and wasn't in fact a gourmet chef in this ONE area! By then I had constructed a book shelf just for her library of cook books, so this discovery flattened me like a pancake!! But we were saved: my mother had hand written her own book of our family recipes and gifted them to us. In that ring binder was: (my) Aunt Dort's Waffle Recipe. Aunt Dort's recipe had its origin somewhere around 1940. No one today cooks like they did then. The hazards of Waffle-itics, Waffleideology and &quot;healthy eating&quot; makes it too dangerous to share here. Suffice it to say: in those days, the approach to all recipes was to take the richest recipe you could find and make it richer. A single segment of Aunt Dort's Waffle could feed a man for a day. For a brief time, I operated a 1/4 scale &quot;sugar shack&quot; in our back yard to supply Michigan Maple Syrup for Aunt Dort's Waffles. Wed, Feb 1, 2012 : 7:18 p.m.
@Hmm, that may be true in general for store-bought products but, with some experimentation and an open mind, there are many home-made items that can be delicious and healthy. Just this morning (after having read this article yesterday) I was inspired to fix my own concocted pancakes consisting of rolled oats, whole wheat flour, cinnamon, tiny amounts of sugar and baking soda, low-fat kefir, ground mixed nuts, one egg and one egg white, topped with blueberries and maple syrup. Scrumptious! Isn't it funny how everything that tastes really good is really bad for you and all the healthy things we're supposed to eat tastes bland or bad? Ahh if only it were reversed that would truly be heaven lol! Wed, Feb 1, 2012 : 3:23 p.m. Substitute whole wheat flour for a better, and more nourishing, taste. We also drop in a bit (1/4 cup or so) of oatmeal flakes for even more enhanced (is that redundant?) flavor and nourishment. Wed, Feb 1, 2012 : 7:03 p.m.
Tue, Jan 31, 2012 : 7:55 p.m. I lived my senior year of high school is Bruxelles. Between the frites and mayonnaise, the Godiva chocolate and fresh waffles cooked at push carts, I was in heaven. I'm gonna try this recipe this weekend. I may even attempt the 1849 version. Arboriginal: I have yet to come across a single 'out of the box' mix that comes even close to that which is cooked from scratch. Doesn't matter what the mix is for. All you have to do is look at the ingredients. If you aren't a chemist, you'll be lost. I'd so much rather do without all that chemical gunk, thank you. Tue, Jan 31, 2012 : 8:46 p.m.
T S Carbon's Malted Waffle Mix. Really. Tue, Jan 31, 2012 : 4:11 p.m. These sound good, but dissing packaged mixes will get you nowhere fast. T S Carbon's Malted Waffle Mix. Nuff said. I've had it. It's just okay.